An easy, one-pan dinner that tastes like you spent all day in the kitchen! I’ve said it before, making a nutritious dinner with real ingredients can be challenging with work, kids, and all the other things going on in our lives. That’s why I love my one-pan Rosemary Chicken Dinner with Roasted Potatoes and Asparagus. 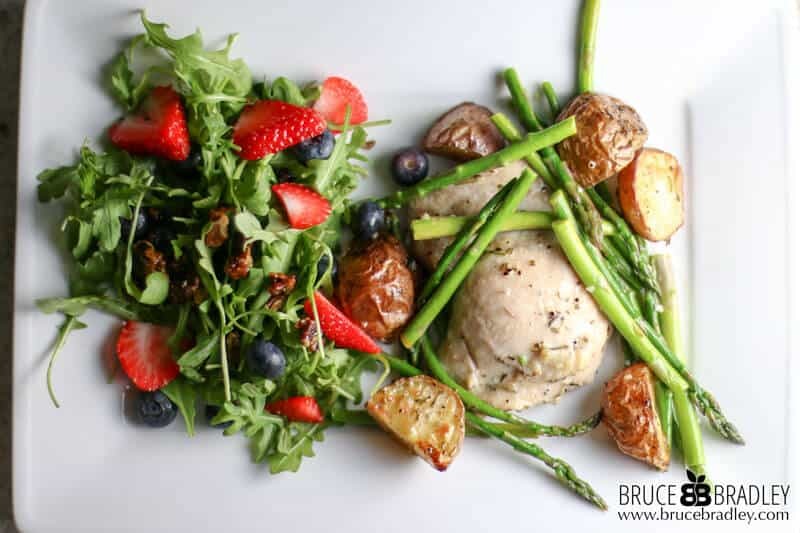 I like to serve this Rosemary Chicken with my Strawberry Salad with Goat Cheese or Triple Berry Almond Salad—but honestly, it’s so delicious and nutritious a salad is definitely optional! What do you need to make this amazing Rosemary Chicken? One pan, two bowls, and the fresh ingredients listed below. So let’s get roasting up a delicious meal! And if you have any extras, this Rosemary Chicken makes a GREAT leftover dinner or lunch! Heat oven to 425°F. Coat 18x13-inch rimmed baking sheet with a little additional oil. In large bowl, mix 2-3 tablespoons of the olive oil, ½ teaspoon of the teaspoon salt, ¼ teaspoon of the pepper and 1 tablespoon of fresh rosemary. Add potatoes and toss to coat. Place potatoes on the pan in a single layer. Roast 20-25 minutes or until potatoes start to brown and are tender when pierced with a fork. While potatoes are cooking mix 2 tablespoons olive oil, ½ teaspoon salt, ¼ teaspoon pepper and 1 tablespoon fresh rosemary in the same bowl used for the potatoes. Add chicken and toss to coat. In a smaller, separate bowl add 1 tablespoon oil, prepared asparagus, and 1 teaspoon minced garlic. When the potatoes have started to brown and are tender, stir them on the baking sheet and place chicken pieces on the sheet. Roast potatoes and chicken for about 12 minutes, then open the oven and arrange asparagus on top. Roast an additional 6-10 minutes longer or until juice of chicken is clear when center of thickest part is cut (or internal temperature reads at least 165°F with an instant read thermometer) and potatoes are nicely browned. Squeeze lemon over dish and serve! We recommend using organic ingredients when possible! If your family prefer chicken breasts over thighs, simply cut three boneless, skinless chicken breasts in half and use them in place of the chicken thighs. If you're using thicker stemmed asparagus, add it to the roasting chicken and potatoes earlier. If you prefer to use dried rosemary instead of fresh, substitute 2-3 teaspoons of dried rosemary. A rimmed stainless steel baking sheet is perfect for roasting this rosemary chicken dish. I love using Avocado oil when I’m roasting food since it has a higher smoke point and tastes delicious and buttery! I love my Thermapen splash proof, instant read thermometer! There are lots of others that work great too—just make sure you calibrate your thermometer so you cook your food to the appropriate temperature. Sounds amazing, but is 20 mi enough to cook the chicken? Thanks for visiting my blog and for your comment! I’ve experimented with this recipe 4 times now. If you’re using small pieces of chicken (like tenderloins) they will take about 15-18 minutes to cook. Regular sized thighs and breasts that have been cut in half take about 20-22 minutes. If you’re using larger pieces of chicken or breasts that haven’t been cut in half, then it will probably take 3-5 minutes longer. Of course, oven temperatures can vary as can the temperature of the chicken when you place it in the oven. So cutting the chicken to see if the juices run clear or using an instant-read thermometer are the best way to make sure the chicken is fully cooked. Just made this last night. WOW! So delicious! Can’t wait to make it again and again and again. This is definitely on our family dinner go-to list!